Applies to: bathroom, living room, bedroom, study, balcony. 1, all solid wood materials used in the atmosphere, bearing strong. 2, the use of water-based wood paint, health and environmental protection. 3, removable structure, easy to install. You can place potted plants, place small objects, decorate the office, kitchen, bedroom, desk, make your life full of vitality. Product dimensions are manually measured, due to different measurement tools, there will be 1-3cm error. Will not be sold. Thank you! 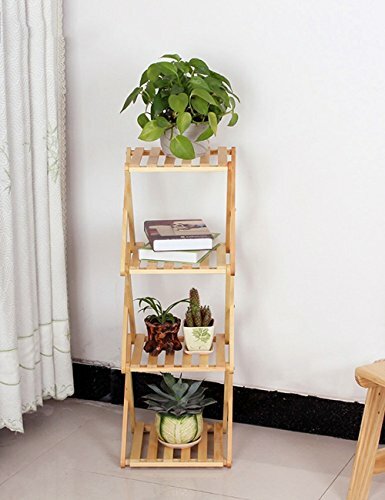 Flower rack in the room played a greater rolePotted not only can go out formaldehyde, but also absorb more carbon dioxide, and placed in the room Potted is not so beautiful,all there will be a flower stand,In each style there are different forms of flower stands,So that they are more close to the style and life match, more beautiful and comfortable. Using high-quality lath stitching, user-friendly design, more convenient to drain, simple and beautiful. Screw fixed, easy to install.